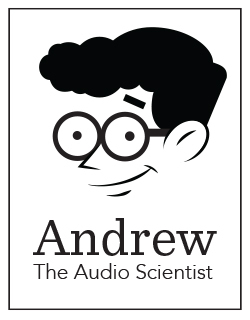 Welcome to another installation of Andrew the Audio Scientist’s insights on audiobook production! Today, I present the first part in my four-week video series, How to Succeed at Audiobook Production. Week 1 addresses the preparation and recording of a new ACX title. Coming up, we’ll cover editing, mastering, and delivering your audiobook productions. Now, watch part one of How to Succeed at Audiobook Production, and after, review the pre-production and recording tips I address in the video. Draft a production schedule – An experienced ACX producer will spend roughly six hours in production for every hour of completed audio. This means , for a five hour title, an ACX producer should anticipate spending at least 30 hours on the successful production and completion of their title. Perform a thorough script prep – Before recording, ensure you’ve read, notated, and fully understood every line of your title. Audiobooks are all about using your voice to tell your Rights Holder’s story, so fidelity to the title is a necessity. Send questions unanswered by your script prep to your Rights Holder, and don’t be afraid to do some research. Sites like AudioEloquence.com are great for determining the accepted pronunciations of foreign, historical, and other uncommon words. Log your optimal settings – Once you’ve obtained a good microphone gain on your audio interface and positioned your microphone perfectly, mark the area with electrical tape so you have a reference. This way, on the following day of recording, you’ll be able to set your position and settings to the exact same positions as before. Verify your room tone before recording – After setting your record levels, ensure you have recorded 30 seconds of clean room tone to analyze. Listen back to your recording with headphones, ensuring no undesirable sounds are contained within. If the sound is clean and quiet, you should be ready to record. Back up your raw audio – If you have not established a file backup technique, see my previous post on File Management. Noise reduction plugins can’t fix a bad recording – Utilizing plugins, such as noise and click reduction, is strongly discouraged. The improper use of such software may introduce new artifacts and undesirable sounds into your audiobook, and they are rarely effective at addressing the noise concerns of audiobooks. If the room in which you’re recording is just too noisy, even after isolating your space, putting up acoustic panels to deaden reflections, and utilizing an in-line high-pass filter to reduce rumble and hum, it’s likely your recording space is not located in an ideal setting. The best solution may be to simply install your recording studio elsewhere. Such a step may seem drastic, but nothing is more important to a successful audiobook production than a great initial record. It is important to keep in mind that, like a marathon, The ACX Mile is best run slow-and-steady. Very few audio errors can truly be “fixed in post,” so it is best to start off on the right foot, even if that makes the actual work a little more time-consuming. I suggest making an ideal and permanent recording setup a top priority. Luckily for you, great audiobooks consist of only two components: your narration, and the recording space. Get that step of the production process down pat, and the rest will come with a little perseverance and healthy amount of impassioned storytelling. Read part 2, which covers audiobook editing and QC, here. AudioEloquence appears to be .com, not .org. Thanks for the great information! I am just getting started and I really appreciate it. Fixed. Thank for the head’s up, Wendy. Great post! I can’t wait to watch the editing and mastering segments! Excellent presentation, Andrew! The link to AudioEloquence.com is a fabulous find. Until now, I have had several links to various pronunciation sites, But this one looks like it contains every possible site out there! Good thoughts about using headfones, too. I have avoided that very thing so I don’t get lost in my voice while recording, but it sure is a great way to detect room noise you don’t even think about! Looking forward to the other videos in the series. Also would hope to attend a seminar if you ever come to the San Francisco area. Just what does encoding entail? I just save in WAV and make a copy (save as) in mp3. Is there more to it than that? Mine is just lived. Woohoo! Thought I’d share this useful post about Audiobook production. Generally spot-on, but should not be considered absolutely the final word. Variables need to apply, with shceduling, with room tone, with “plug ins” (Audiciacity has a noise filter I used with every recording, lightly). damn what a lot of mizzzzzpellings! Nice! Thank you! Looking forward to the next one! This is excellent, and Andrew is a great presenter. Just what does encoding entail? Again, I just save as a WAV file and then submit a copy in mp3. Sorry for re-posting, but I didn’t see anything that seemed like a response to that question. how do you get the file to measure between -23dB and -18dB RMS? I can’t seem to get it! I have the same question as Elisha. I have an older version of Pro Tool, v7. I have done voice acting but little finished production. Their Help is not good. Can someone tell me where I can find out how I see the dB ranges? I also need to know how to get the range to between -23dB and -18dB. I also need to understand the ambient ground floor -60dB and how I see that. Thanks for the info or advice where I can find this. Thank you for the great presentation full of useful information. So helpful. the inlinehigh pass filter does not work with the At2020usb mic. Is there another kind of filter I can use that works with that one?